On Saturday the Evansville Regional Airport and EVV Pilots Club held a special class at Tri-State Aero. The goal: get the wheels off the ground for an eager classroom. For many pilots, the passion for flying never fades away, but sometimes, life happens. "[I’m] a rusty pilot. 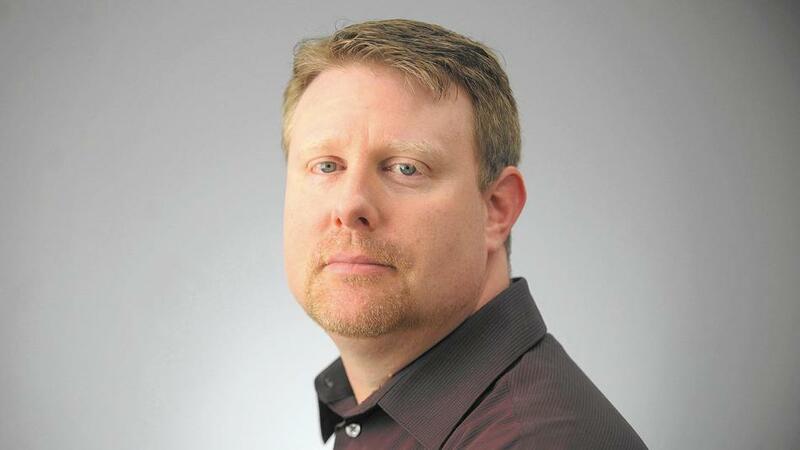 I used to fly as a young man and enjoyed it a lot, then got married, had kids, and couldn't afford it, and now I can afford it again, and want to get back involved,” Michael O’Daniel said. He’s not alone. Research by the Aircraft Owners and Pilot's Association shows there's more than a half million inactive general aviation pilots, and 85 percent of them want to get back in the cockpit. "These people have experienced this before. This is to help them refresh their memories so that they can become a safe and efficient pilot once again,” Ron Timmermans said. Timmermans gives rusty pilot classes across the county. Once a person gets their private license, they're a pilot for life, but they still have to get a flight review with an instructor every two years. "Regulations change over the years. Like airspace may be different from the time the learned to fly, from what it is today,” Tri-State Aero flight instructor Steven Matthews said. It's been a little longer than two years for O'Daniel, who hasn't flown by himself since he was 24. "Oh, I don't think it's any challenge at all. You just have to commit the time and get excited about it, and get back into learning it,” O’Daniel said. "All the rules involve not bumping into anybody else. You want to keep separation, and airplanes move pretty fast. So you have to follow the rules, and understand the rules, to make sure that everybody's safe up there." Keeping the sky safe and keeping minds sharp is a win-win for rusty pilots, and their instructors. 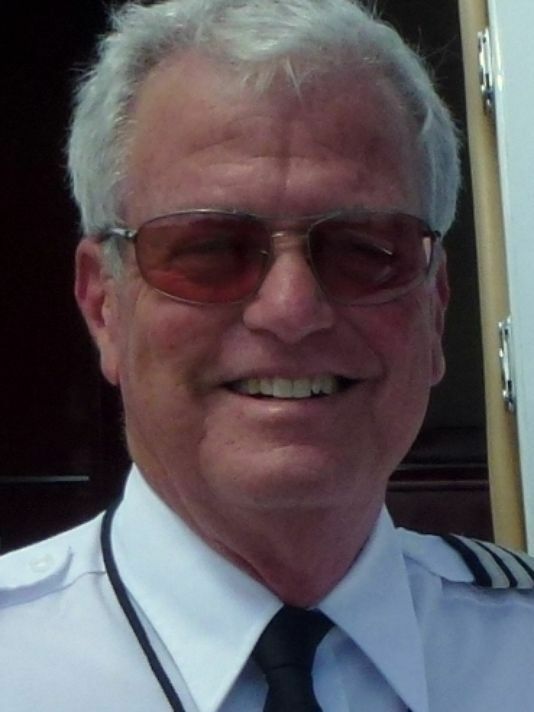 "I very much enjoy flying, and I enjoy teaching it almost as much,” Timmermans said. The private pilot and passenger were departing on a personal, cross-country flight from a grass runway. 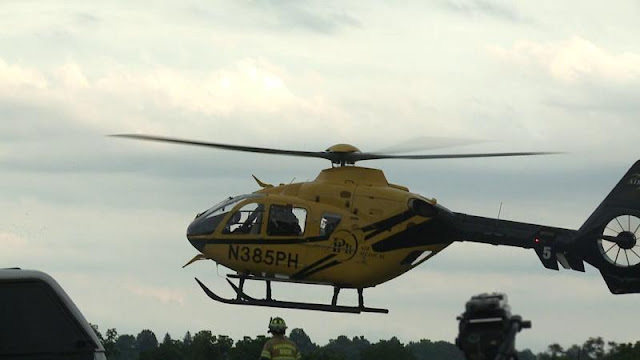 A witness saw the airplane lift off from the 2,081-ft-long- runway near midfield with a high pitch attitude, but he did not see the subsequent climbout or accident. The airplane impacted tall trees about 1,100 ft past the departure end of the runway. Given the witness's statement, the pilot likely did not lower the airplane's nose to accelerate while in ground effect, as recommended by the Federal Aviation Administration for a soft-field takeoff. Instead, the pilot likely attempted to climb the airplane at too high of a pitch angle and too low of an airspeed during the soft-field takeoff. Further, the airplane was near or above its maximum gross takeoff weight. The combination of these factors led to the airplane climbing out at an insufficient airspeed and its subsequent inability to adequately climb out of ground effect and clear the trees off the departure end of the runway. In addition, a light tailwind likely existed during the climb, which the pilot may not have noticed due to trees surrounding the runway and windsock. The pilot's use of an improper soft-field takeoff procedure, which resulted in the airplane having insufficient airspeed to climb out of ground effect and its subsequent impact with trees near the departure end of the runway. On June 13, 2016, at 0957 eastern daylight time, a Cessna 150F airplane, N102DK, impacted trees and terrain after departure from Butler Field Airport (IN46), Rockville, Indiana. 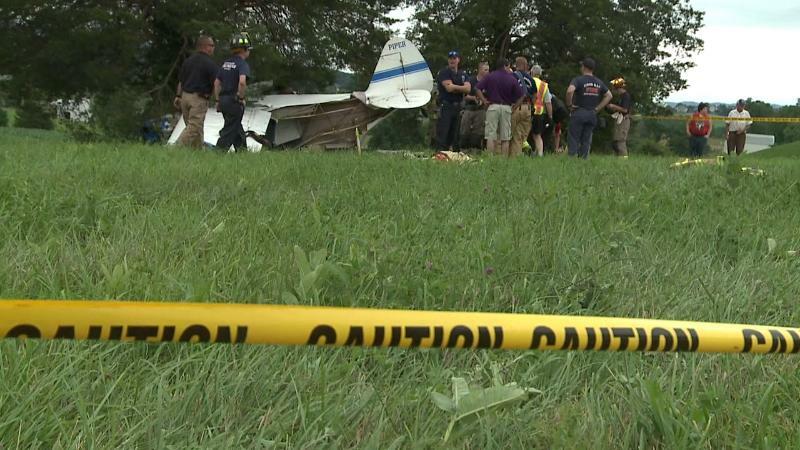 The pilot and passenger were fatally injured, and the airplane was destroyed. The airplane was registered to and operated by a private individual as a 14 Code of Federal Regulations Part 91 personal flight. Day visual meteorological conditions existed about the time of the accident near the accident site, and no flight plan filed. The flight was destined for Eagle Creek Airpark, Indianapolis, Indiana. According to a witness who was mowing grass at IN46, the airplane lifted off from the grass runway near midfield. The witness noticed that the airplane initially climbed with a high pitch attitude, but he did not observe the subsequent climbout or accident. The airplane struck the top of 50-ft-tall trees located about 1,100 ft past the departure end of the runway and came to rest about 125 ft beyond the initial tree strike. A postcrash fire ensued. 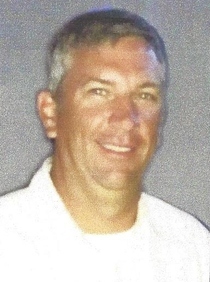 The pilot, age 44, held a private pilot certificate with an airplane single-engine land rating. On March 15, 2016, the pilot was issued a third-class medical certificate with no limitations. At the time of the medical examination, the pilot reported having 60 hours of total flight time with 25 hours in the last 6 months. The pilot's logbooks were not available for the investigation. The accident airplane, a Cessna 150F, was manufactured in 1966. It was powered by a Continental Motors O-200A engine, serial number 63037-6-A. On April 24, 2002, the Federal Aviation Administration (FAA) approved the use of auto gas for the airplane and engine in accordance with supplemental type certificates SE634GL and SA633. At the time of the airplane's last annual inspection on December 26, 2015, the airframe had accumulated 6,184 total hours, and the engine had accumulated 961 hours since its last overhaul. At 1015, the weather observation station at Edgar County Airport, Paris, Illinois, located about 21 miles west of the accident site, reported wind from 110° at 3 knots, visibility 10 miles, clear skies, temperature 24° C, dew point 13° C, and altimeter setting of 30.06 inches of mercury. IN46 was a privately owned, uncontrolled airport, located in a rural area 2 miles south of Rockville, Indiana. The airport elevation was 687 ft mean sea level, and the grass runway, oriented in a 09/27 configuration, was 2,081 ft long and 65 ft wide. The runway was dry and in good condition at the time of the accident. When using runway 27, a 20-to-1 slope was required to clear trees 500 ft beyond the departure end. The wreckage was located about 1,100 ft beyond the departure end of runway 27 slightly right of the projected runway centerline. Damage was observed to the tops of trees about 125 ft preceding the wreckage location, and broken branches were found below these trees. Broken tree branches were consistent with the airplane descending through the trees at an angle of about 70°. No damage was noted to terrain outside of the immediate footprint of the airplane, which came to rest upright and aligned with the runway heading. The cabin area of the fuselage was destroyed by fire, but the tail section was mostly intact and undamaged by fire. Damage to both wing leading edges was consistent with tree and branch impact. One of the propeller's blade tips was bent forward at a 90° angle, and the other blade was bent aft and embedded in the ground. Examination of the airplane revealed normal flight control continuity, and no anomalies of the flight control surfaces were noted. The flaps actuator indicated that the flaps were in the "up" position and that the elevator trim was near the "neutral" position. All cockpit engine controls were fire damaged, and the throttle was observed in the "full open" position. The engine was removed for further examination, and the carburetor was disassembled, and no anomalies were noted except for thermal damage. The throttle and mixture control arms moved freely by hand, and the accelerator pump actuated normally. The top spark plugs were removed, and the electrodes exhibited normal signatures. The cylinder combustion chambers were examined with a lighted borescope, and no anomalies were noted. The propeller was rotated by hand, and engine continuity was confirmed with thumb compression obtained on all four cylinders. The magnetos and ignition harness were thermally damaged, and the magnetos did not produce spark. Examination of the airframe and engine revealed no evidence of mechanical malfunctions or failures that would have precluded normal operation. 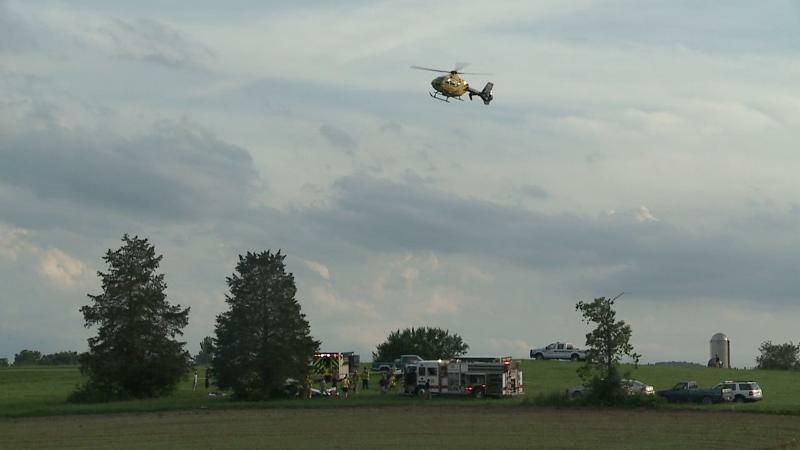 The Terre Haute Regional Hospital Department of Pathology conducted an autopsy on the pilot. 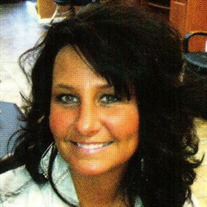 The autopsy report noted the cause of death was "blunt force injuries." The FAA's Civil Aerospace Medical Institute performed toxicology tests on the pilot's specimens, and the results were negative for tested drugs. Based on the pilot's medical certificate weight, the passenger's driver's license weight, and a full fuel load of 26 gallons, the airplane's takeoff weight would have been 45 lbs above its maximum gross weight. 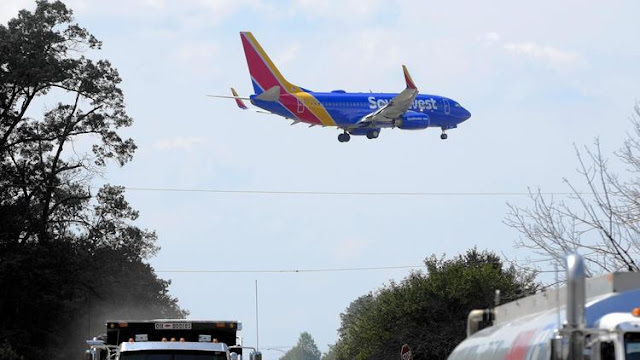 Although a witness observed the pilot add fuel to the airplane with plastic jugs from his car trunk, the investigation was unable to determine the actual amount of fuel onboard the airplane during the takeoff. Based on the Pilot's Operating Handbook performance chart, at maximum gross weight and 24° C with no wind, 1,500 ft of runway would have been needed to clear a 50-ft-high obstacle. The chart did not contain a correction for a grass runway. Ground effect is a condition of improved performance encountered when the airplane is operating very close to the ground. Ground effect can be detected and measured up to an altitude equal to one wingspan above the surface. When the wing is under the influence of ground effect, there is a reduction in upwash, downwash, and wingtip vortices. As a result of the reduced wingtip vortices, induced drag is reduced. Due to the reduced drag in ground effect, the airplane may seem to be able to take off below the recommended airspeed. However, as the airplane rises out of ground effect with an insufficient airspeed, initial climb performance may prove to be marginal because of the increased drag. Under conditions of high-density altitude, high temperature, and/or maximum gross weight, the airplane may be able to become airborne at an insufficient airspeed, but unable to climb out of ground effect. Consequently, the airplane may not be able to clear obstructions. After becoming airborne, the nose should be lowered very gently with the wheels clear of the surface to allow the airplane to accelerate to Vy, or Vx if obstacles must be cleared. Extreme care must be exercised immediately after the airplane becomes airborne and while it accelerates, to avoid settling back onto the surface. An attempt to climb prematurely or too steeply may cause the airplane to settle back to the surface as a result of losing the benefit of ground effect. An attempt to climb out of ground effect before sufficient climb airspeed is attained may result in the airplane being unable to climb further as the ground effect area is transited, even with full power. Therefore, it is essential that the airplane remain in ground effect until at least Vx is reached. On June 13, 2016, at 0957 eastern daylight time, a Cessna 150F airplane, N102DK, impacted terrain while departing from Butler Field Airport (IN46), Rockville, Indiana. 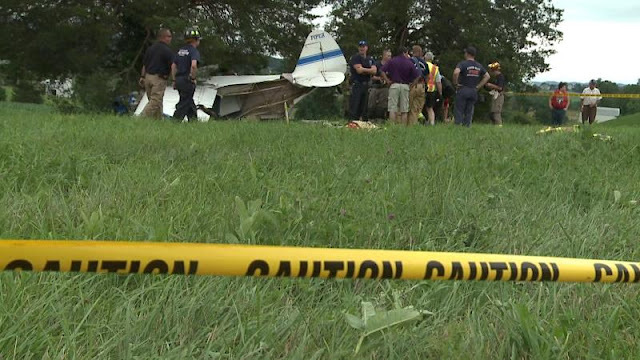 The pilot and passenger were fatally injured and the airplane was destroyed. The airplane was registered to and operated by a private individual under the provisions of 14 Code of Federal Regulations Part 91 as a personal flight. Day visual meteorological conditions existed at the time of the accident. The flight departed without a flight plan and was destined for Eagle Creek Airpark (EYE), Indianapolis, Indiana. According to a witness mowing grass at IN46, the airplane lifted off near midfield from the 2,081 x 65 ft turf runway. The witness noticed the airplane initially climb with a high pitch attitude, but did not observe the subsequent climb out or accident. The airplane struck the top of trees located about 1,125 ft from the departure end of the runway and came to rest about 125 ft beyond the initial tree strike. A post-crash fire ensued. The action came nine months after the Federal Aviation Administration implemented a new "modernized" air traffic management system. The same program arrived at BWI Thurgood Marshall Airport in spring 2015. NextGen had the same intrusive and disruptive impact on residents of Anne Arundel and Howard counties. The difference? Our state and county are still in the "talking" phase. The FAA says NextGen will result in $160 billion in savings by 2030. It promises reduced carbon emissions, decreased fuel consumption and fewer flight delays. It's already delivered anxiety, sleepless nights and fears of falling home values and quality of life for many Anne Arundel residents. Local leaders are relying on cordial correspondence with the feds instead of taking an aggressive stance as noise complaints centered around BWI spiked to 1,849 in 2015 from 835 in 2014. A request for 2016 data from the state's Office of Noise, Real Estate and Land Use Compatibility was not fulfilled. At this point, what's left to say? How many different ways can residents say, "My walls shake. I can't sleep at night. I can't talk with my neighbors outside because more planes are flying lower (and louder) than before NextGen?" Talk. That's all we've received. Anne Arundel County Executive Steve Schuh sent a letter to FAA chief Michael Huerta on April 5, 2017 seeking a town hall be held in the county with impacted communities. This would allow residents to "voice their concerns regarding departure procedures that were never addressed sufficiently" by the FAA prior to implementation. Schuh wants FAA leaders to hear concerns. This comes nearly two years after Phoenix sued the FAA to halt NextGen. A three-judge panel of the U.S. Court of Appeals for the District of Columbia Circuit held a hearing in the Phoenix's case on March 17. The county and state need a plan. Saying "pretty please" hasn't expedited the process. Maryland is asking the federal government to do the right — and responsible — thing. Two years of polite requests have changed nothing. The county and state must take the fight to the feds. When the talk ends, and if the FAA rejects our pleas for change, what is the next step for Marylanders? Gov. Larry Hogan and Schuh should join the state's Democratic congressional delegation — who also were tardy to the party — Anthony Brown, Elijah Cummings, Dutch Ruppersberger, John Sabanes, John Delaney and Jamie Raskin, Ben Cardin and Chris Van Hollen — in demanding the FAA revert to its previous flight path program. The Democratic delegation sent a letter to the FAA on Wednesday urging it to act on the DC Metroplex BWI Community Roundtable's NextGen solution. The roundtable recommends immediately reverting to the pre-NextGen flight paths and procedures. The county should follow Howard County's lead and authorize its attorney to sue the FAA if changes aren't immediately made. State leaders should join forces in federal court with Howard County, Phoenix, three Southern California communities and other cities and states impacted by this ill-conceived cost-saving plan. The roundtable took four months to say what should have taken a day. Federal bureaucrats will predictably drag their feet so it's conceivable an answer won't come until the end of the year. More uncertainty of continued air terror for thousands of county residents is immoral. They deserve a definitive answer: either their property values sink or they'll receive relief. Imagine trying to sell a house when prospective buyer's questions are drowned out by screeching 737s that rumble by every few minutes. Increased noise associated with NextGen has robbed many residents of their outdoor joys. Some have abandoned gardening and outdoor dining because of the incessant high-decibel bombardment coming from passenger and commercial aircraft. NextGen is an unmitigated disaster created by the Obama administration for everyone who is not a bean counter. A speedy resolution is not a partisan issue. Del. Nic Kipke, R-Pasadena, has constituents who say they can see passengers in low-flying aircraft through the plane's windows. A coalition of Maryland's elected leaders needs to say loud and unequivocally, "END NextGen NOW." The flight instructor in the multiengine airplane reported that, during a simulated single-engine instrument approach to runway 2, the right engine was configured for the simulated failure. The instructor added that the goal was to perform a missed approach on one engine and note the airplane’s performance. The pilot under instruction descended to the decision height and executed the missed approach procedure, but the airplane would not climb. The flight instructor told the pilot to go to full power on both engines. According to the flight instructor, “mixtures, props and throttles were all full forward and the fuel flow levers were both at the ON position,” and he took control of the airplane. The flight instructor reported that there were trees and buildings to the north and that he made a left turn about 400 ft above ground level with the intent to land on runway 14. He extended the landing gear but realized that he would not reach the runway. He executed a forced landing to the southwest on taxiway Sierra, the airplane crossed over runway 32/14, and although heavy braking was applied, the airplane exited the taxiway and impacted a drainage culvert. The airplane sustained substantial damage to the aft fuselage stringers and longerons. The airport elevation was 488 ft, the density altitude was 2,120 ft, the temperature was 81°, the dew point was 66° F, and the wind was calm, and the flight instructor stated that carburetor heat was not used during the approach on either engine. The relative humidity was about 60 percent, and the weather conditions were conducive to serious icing probability when operating in a gliding flight profile. The flight instructor’s failure to use carburetor heat during the approach while operating in atmospheric conditions that were conducive to carburetor icing, which resulted in a loss of engine power due to carburetor icing. Per the AOPA Carburetor Ice Probability Chart, the relative humidity was about 60 percent and there was serious icing probability when operating in a gliding flight profile. 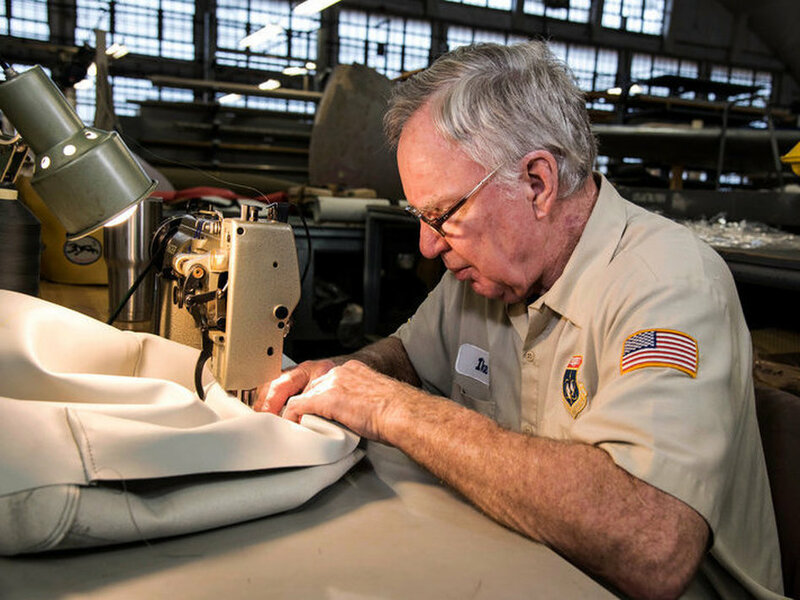 Channel Islands Aviation founder and owner Mark Oberman, of Camarillo, has been recognized with the Wright Brothers Master Pilot Award, the Federal Aviation Administration’s most prestigious award for certified pilots. The honor goes to U.S. citizens “who have exhibited professionalism, skill, and aviation expertise for at least 50 years while piloting aircraft,” according to the FAA. To be eligible, pilots must be a citizen and hold a U.S. Civil Aviation Authority or FAA pilot certificate, and have 50 or more years of civil and/or military flying experience. Awardees have their name, city and state added to the “Roll of Honor,” which is published on the FAA’s website. Oberman graduated from Cal Poly San Luis Obispo with a degree in agricultural and engineering and started his career working at McDonnell Douglas in Marina del Rey as an associate engineer scientist working on rockets, many of which were launched from Vandenberg Air Force Base in Lompoc. Oberman decided to combine his career and flying hobby and launched his own company, Channel Islands Aviation, in 1975. He had identified the demand for charter flights to the Channel Islands when he took his first charter flight to Santa Cruz Island on Jan. 1, 1975. The following year, he and his wife, Janie, established Channel Islands Aviation at the Camarillo Airport. Oberman will receive his award at the 2017 Aircraft Owners and Pilots Association Fly-In set for April 28 and 29 at the Camarillo Airport. The flight instructor and student pilot were departing on an instructional cross-country flight when, just after takeoff, the airplane encountered wind and turbulence. The instructor had difficulty maintaining altitude and elected to perform an off-airport precautionary landing, during which the right wing sustained substantial damage. A weather study revealed conditions conducive to low-level wind shear and turbulence at the accident site at the time of the accident. Although the instructor had received an abbreviated weather briefing before departure, the briefing did not advise of the potential for low-level wind shear. It is likely that the encounter with wind shear during departure made it difficult for the airplane to maintain altitude. The airplane’s encounter with low-level wind shear during takeoff, which resulted in an off-airport landing. 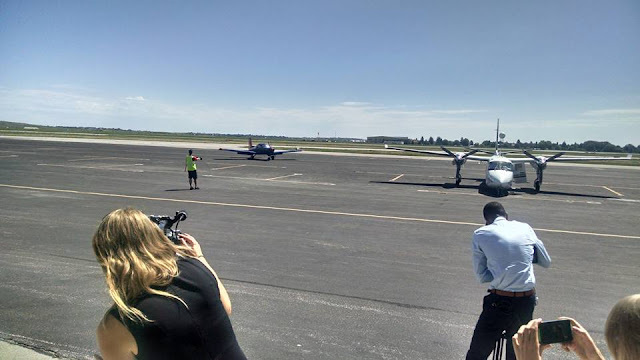 On July 7, 2016, about 1155 mountain daylight time, a Gulfstream American CORP AA-5A airplane, N26908, was substantially damaged during a forced landing after departing Cheyenne Regional Airport/Jerry Olson Field (KCYS), Cheyenne, Wyoming. 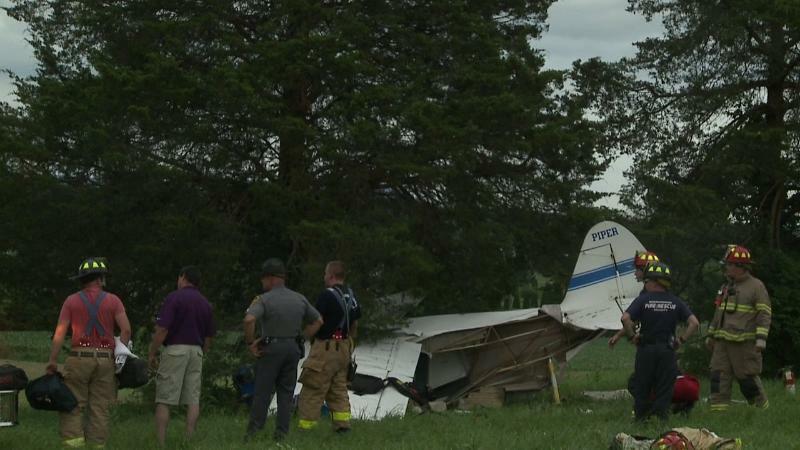 The flight instructor and student pilot were not injured. The instructional flight was conducted under the provisions of 14 Code of Federal Regulations Part 91. Visual meteorological conditions prevailed and a visual flight rules flight plan had been filed for the flight. The flight was originating at the time of the accident and was en route to Eppley Airfield (KOMA), Omaha, Nebraska. The flight instructor stated that the takeoff was normal; however, at the departure end of the runway, between 300 and 400 feet above the ground, "the wind started blowing from all directions" and he had difficulty maintaining control of the airplane. The flight instructor had difficulty maintaining altitude and elected to land the airplane on the road next to a school. During the landing roll, the flight instructor maneuvered the airplane to avoid hitting construction workers directly ahead of him. The right wing hit a construction sign and was substantially damaged. The pilot stated that there were no mechanical anomalies with the airplane or engine at the time of the accident. A weather study was conducted by a meteorologist with the National Transportation Safety Board. The National Weather Service charts depicted a low pressure system over southeast Wyoming and a mid-level trough just west of the accident site. Winds at the 700-hPa level were westerly around 10 knots, whereas winds at the 500-hPa level increased to 60 knots. There were no AIRMETs, SIGMETs, or center weather advisories valid for the accident site at the time of the accident. One PIREP in the area reported moderate "chop" between 6,500 feet and 8,500 feet mean sea level. The terminal aerodrome forecast valid at the time of the accident forecast winds from 300° at 12 knots gusting to 20 knots. Cheyenne Regional Airport had the closest official weather station to the accident site, 2 miles south-southeast of the accident location. The observation taken at 1153 reported wind 090° at 9 knots, and clear skies. The observation taken at 1208, after the accident, reported wind from 090° at 7 knots. The closest non-official surface observation site (5 miles west of the accident site) reported wind from 274° with gusts to 19 knots at 1215. Weather service radar depicted a dry-line boundary at the accident site, at the time of the accident. Wind speed and direction changed with altitude associated with this dry-line boundary and would have had a corresponding increase in low-level turbulence and low-level wind shear. A search of official weather briefing sources revealed that the flight instructor contacted Lockheed Martin Flight Service at 0853 on the morning of the accident and received an abbreviated briefing for the flight from Rock Springs, Wyoming, to Cheyenne, Wyoming. There was no record of the flight instructor receiving or retrieving any additional weather information before the accident flight. 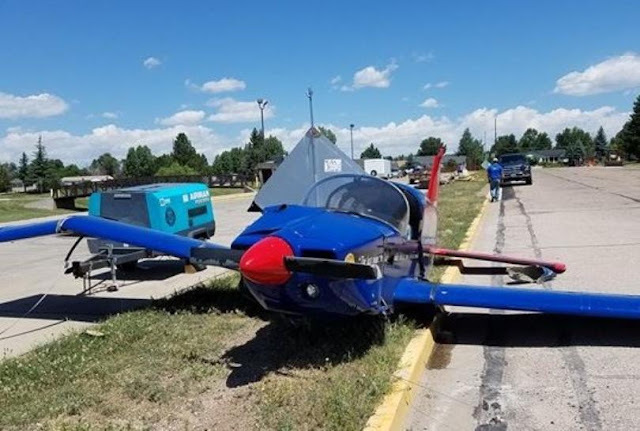 On July 7, 2016, about 1200 mountain daylight time, a Gulfstream American CORP AA-5A airplane, N26908, was substantially damaged during a forced landing after departing Cheyenne Regional Airport/Jerry Olson Field (KCYS), Cheyenne, Wyoming. 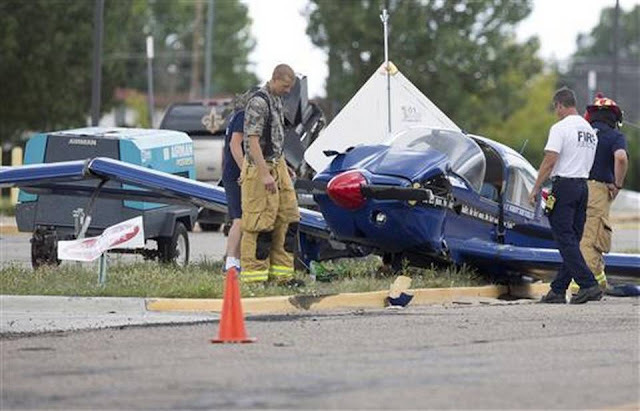 The flight instructor and student pilot were not injured. The instructional flight was conducted under the provisions of 14 Code of Federal Regulations Part 91. 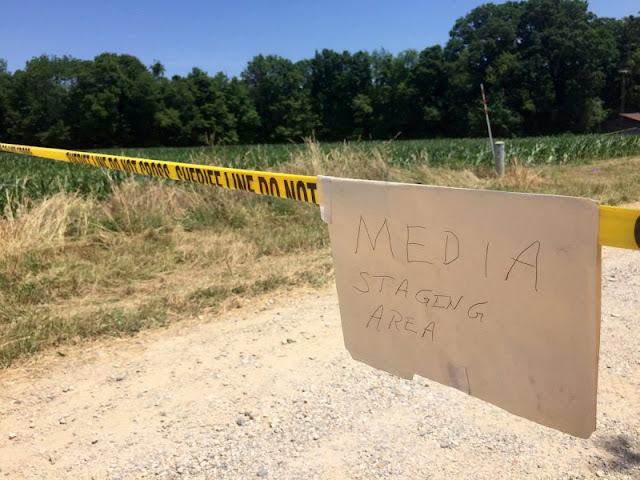 Visual meteorological conditions prevailed and it is unknown if a Federal Aviation Administration (FAA) flight plan had been filed for the flight. The flight was originating at the time of the accident and was en route to Eppley Airfield (KOMA), Omaha, Nebraska. The flight instructor reported that after takeoff the airplane encountered very windy conditions and he was unable to control the airplane. The airplane was unable to climb out and the flight instructor performed a forced landing to a road. The pilot maneuvered the airplane to avoid a collision with a construction crew on the road. The right wing was substantially damaged when it impacted a construction sign. Cheyenne, Wyo. - A plane that crashed near Central High School on Thursday (7/7/16) was being piloted by 16 year-old Isaiah Cooper. Cooper was not hurt in the hard landing; he was on a quest to become the youngest African American to pilot an airplane around the continental United States of America. His crash comes just moments after we spoke to him about his flight. Immediately following takeoff, he encountered extreme wind shear in what is called a microburst. Recognizing this adverse weather phenomena, Isaiah executed emergency procedures flawlessly, avoided obstacles, and landed on a nearby street. During ground rollout, the plane struck a street sign and sustained damage. No people were injured, and no property was damaged in this landing. He will stay in Cheyenne, WY until a replacement aircraft is secured. Isaiah remains determined to complete his flight around the continental United States. 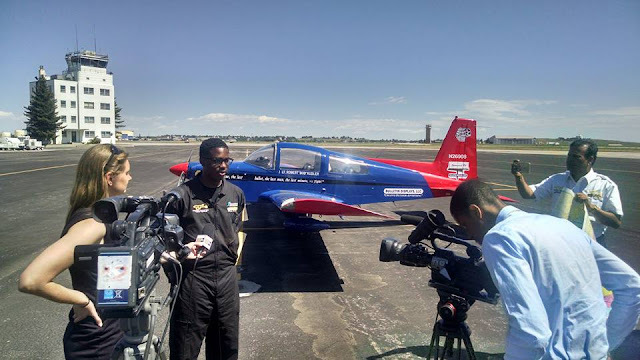 Compton, California – July, 5th 2016 (TAM) A pioneering African-American teenage pilot from Compton, who learned how to fly at the Los Angeles inner city aeronautical program, is Piloting an airplane around the Continental United States from Compton to Washington, to Maine, to Florida, and back to Compton on a record setting journey. 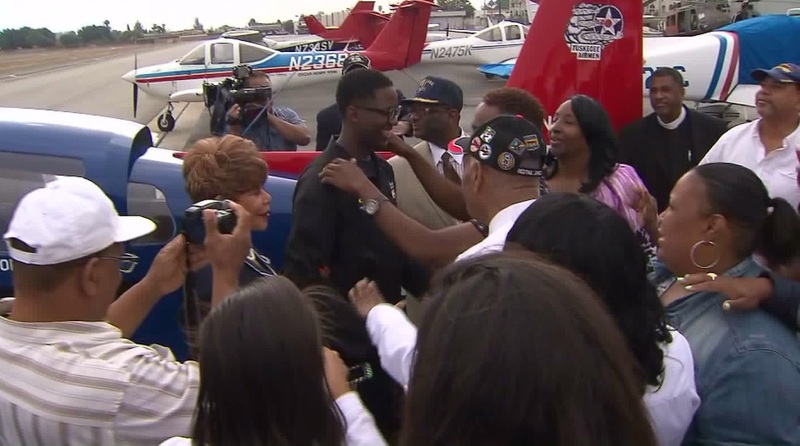 On July 5th, 16 year-old Isaiah Cooper started his quest to become the youngest African American to pilot an airplane around the continental United States of America. He left from Tomorrow’s Aeronautical Museum at the Compton airport at 9:00am. This is a practice flight in preparation for the Guinness World Record breaking attempt to be the youngest person to fly solo around the Earth at age 18. Isaiah was mentored by Robin Petgrave, founder and Executive Director of Tomorrow’s Aeronautical Museum (TAM). In 1998 Mr. Petgrave, a successful entrepreneur and pilot, decided to focus his attention on at-risk inner city youth so he sold his multimillion company, Bravo Helicopters & Wings and build TAM. In addition to aviation, TAM offers after-school educational programs, gang and drug intervention, life skills, safe haven and many other activities designed as an alternative to self- destructive behaviors. TAM is noted for being the recipient of a unanimously passed United States Congressional Resolution 532 in recognition of the museum’s achievement and success in teaching aviation, engineering, and flying to “at-risk” and economically disadvantaged minority students. Mr. Petgrave was an Ebony Power 100 in 2013. 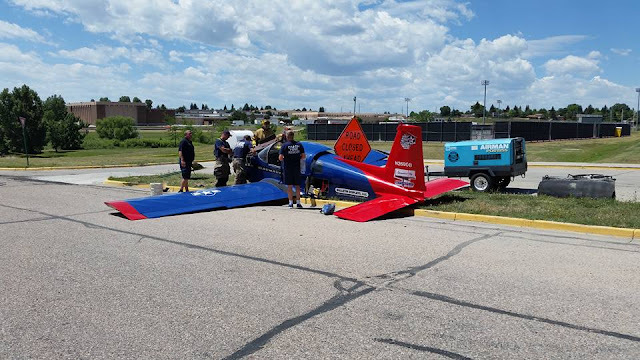 The Cheyenne Police Department responded to a plane that landed in the 5700 blk of Education Drive around noon today. No injuries reported. As seen from Sky5, Isaiah Cooper takes off from Compton airport on July 5, 2016. 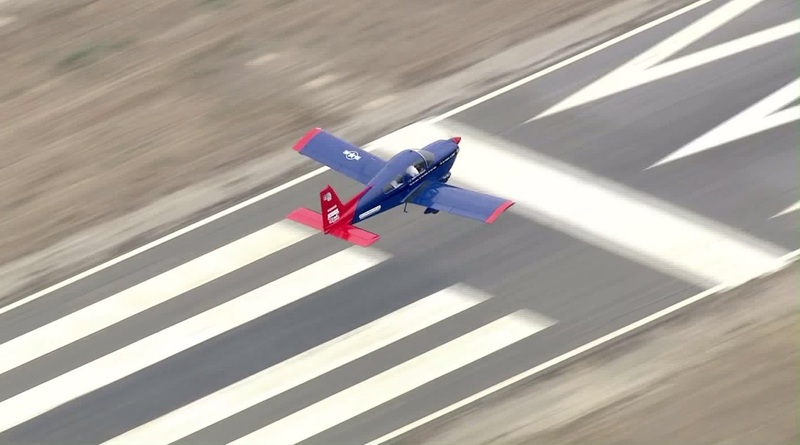 A 16-year-old boy who learned to fly at Compton/Woodley Airport is aiming to become the youngest pilot to fly solo around the Earth, taking aim at an entry in the Guinness World Records. 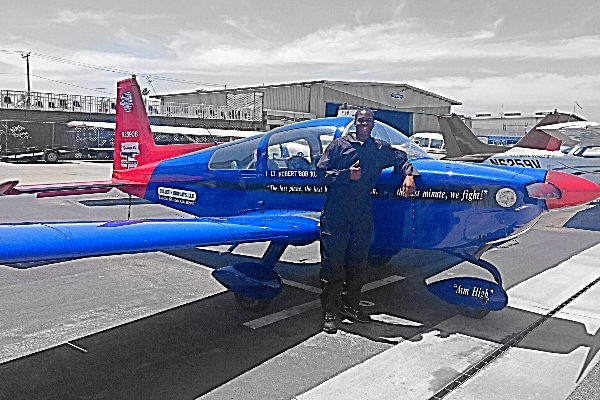 But first, Isaiah Cooper intends to break another barrier: he wants to become the youngest African-American pilot to fly around the continental United States. 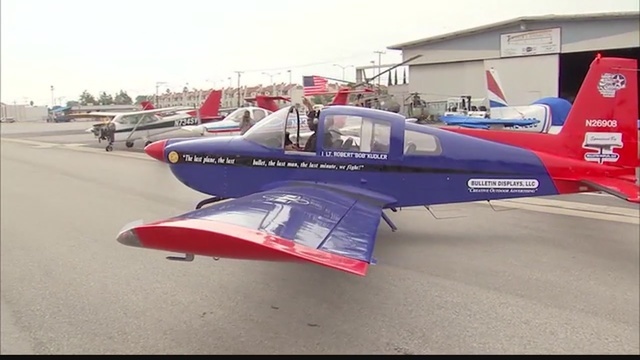 He departed on that attempt Tuesday morning, leaving from outside Tomorrow’s Aeronautical Museum at the Compton Airport, where he was a member of an at-risk youth program that teaches local children to fly. He hopes his flight will inspire other teens. His mother just wants him to call home every time he lands. She cried at her son’s departure event, which brought dozens of family members and friend to the airport before takeoff. 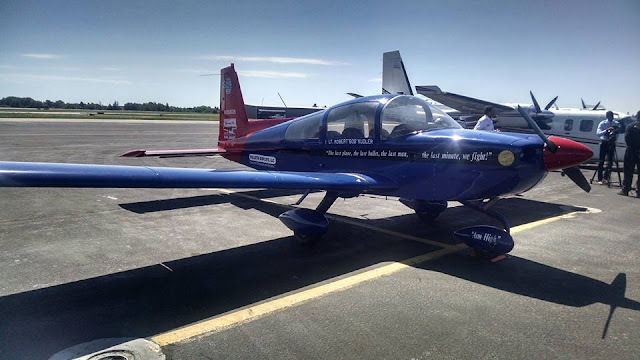 Cooper and his flight instructor Roger Azad will fly from California to Washington state, to Maine, down to Florida and back across the country, with several stops along the route. They’ll fly about eight hours a day. The attempt is a practice flight for the larger goal, which Cooper hopes to complete next year. "It's making him truly believe he can do anything he wants to," said Robin Petgrave, who founded the museum and flight program. 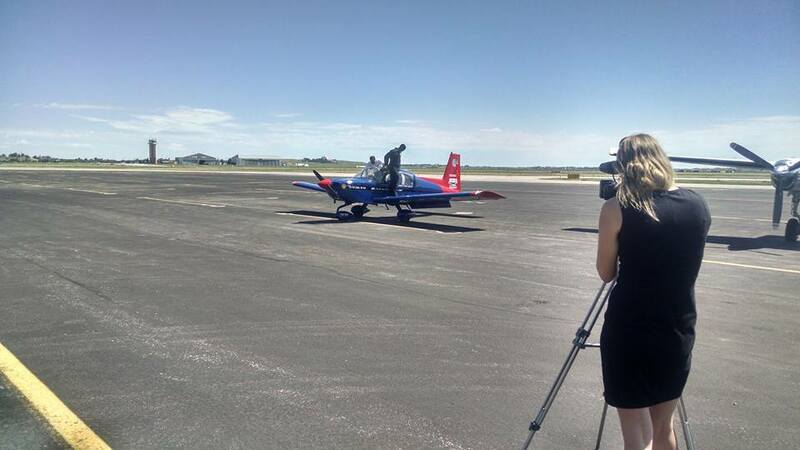 The current Guinness record-holder for the youngest person to fly solo around the world is Matthew Guthmiller, who finished his flight in El Cajon, in San Diego County, at age 19 in July 2014.
Cooper wants to break the record when he is 18. An 18-year-old Australian man is trying to break the record now. After a group prayer, Isaiah Cooper gets a hug before his departure from Compton airport on July 5, 2016. COMPTON, Calif. (KABC) -- A 16-year-old from Compton is aiming to break a world record by becoming the youngest African-American pilot to fly around the continental U.S.
Isaiah Cooper's family and friends gathered around the teen and prayed for his journey before he took off Tuesday morning. "I'm so happy that I get this opportunity, and most people don't," Cooper said. That opportunity began when Cooper was just 5 years old. That's when he first attended Tomorrow's Aeronautical Museum in Compton, a program that teaches inner-city kids about flying and offers academic support. "Around 9 years old is when he became a co-pilot," said Natalia Knox, Cooper's mother. However, Cooper admits he later left the program and started making some bad choices. "After middle school, I got involved with the wrong crowd," Cooper said. Inspired by the founder of the museum, Robin Petgrave, Cooper came back and asked for help. "I want to do everything he did times 10, but at the same time I want to be humble enough to come back here and tell him, 'It only happened because of you,'" Cooper said. So Petgrave challenged Cooper to break a world record. "At first I didn't believe him, so then I was at work, and he called and he put Robin on the phone, and then I knew he was serious," Knox said. For Cooper, it's all about motivating other young people and making Compton proud. "I'm trying to teach them at a young age that if they put guns down and they make better decisions with their lives, they can all do something like this," Cooper said. "Or even if they don't want to do something like this and they want to do something better, they still have that opportunity." 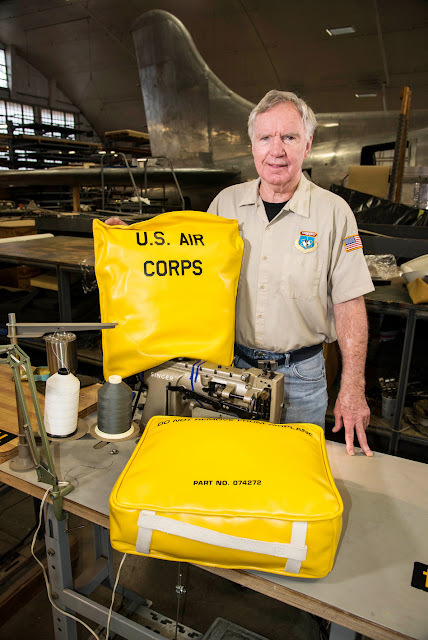 Cooper's instructor is accompanying him on the trip, which will span more than 8,000 miles. Cooper is already making plans for next year. "If this does go successfully, then next year at the age of 18, I'll be the youngest to fly around the world," Cooper said. 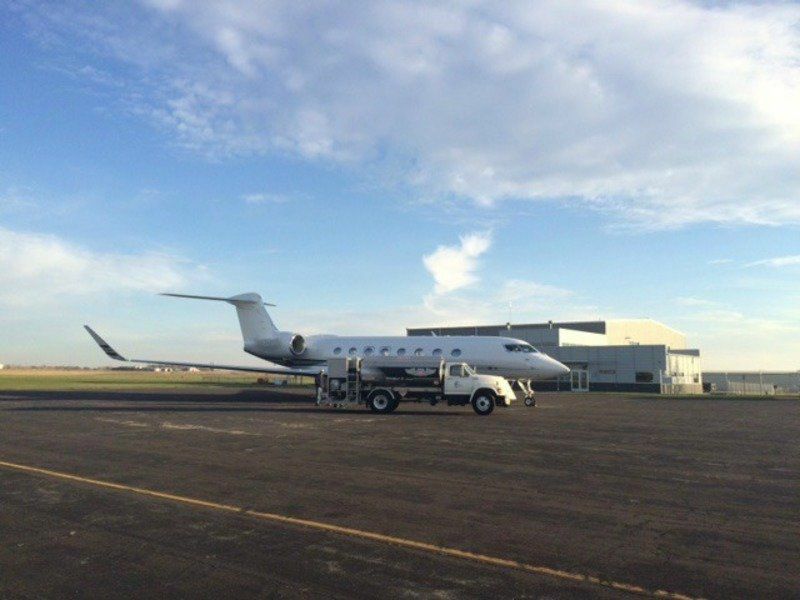 CLINTON — The Clinton Municipal Airport continues to be a crucial factor in the economic development in the Gateway area. The airport serves as the landing spot for executives of many of the region’s top companies and corporations, but it is also the hub for site selectors of potential future industries – something that area economic development specialists are always keeping an eye out for. Normal days at the airport can feature aircraft of all sizes stopping in for fuel, maintenance, or perhaps even just a break and a cup of coffee. The airport’s activity and usage numbers vary from year to year, along with its fuel sales. Though fuel sales are slightly lower this year than last year, it’s not worrisome to Nass. Economic uncertainty in recent months, Nass says, limited some companies’ air travel. Airport officials are always looking to generate more revenue, and that can be as simple as persuading a group that might normally land in the Quad-Cities to go a bit further north and stop in Clinton, a scenario which has recently happened. Nass has also looked into hosting pilot training and flight instructing sessions after receiving some community interest as of late. Nass said last summer’s Fly Iowa event at the airport may have sparked an interest in the community when it comes to learning how to fly. With a little more research, the possibility of offering those services will become more of a realization for Nass and his staff. “It’ll just take a little more homework to get that done, but it’s certainly something that we’re looking into,” Nass said. The plane was built in the summer of 1942 by Boeing in Seattle, and flew from Bangor, Maine, by way of Scotland, then on to an Army Force Base in England. A 10-man crew was put together, the youngest was 19. Captain Robert Morgan, the pilot, named the plane after his girlfriend. The pilot/owner of the single-engine, tailwheel-equipped airplane was attempting to depart from a private turf runway. During the takeoff, a wind gust contacted the airplane from the left side, and the airplane veered to the right. 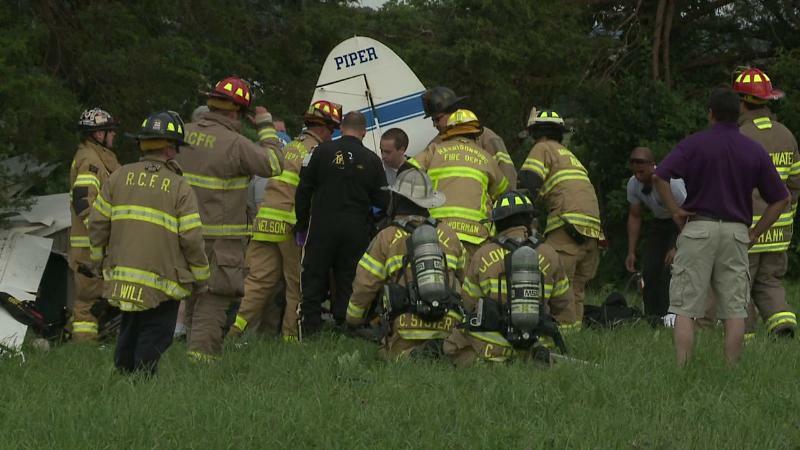 The airplane's right wing and propeller then struck a fence post. The pilot tried to fly the airplane back to the runway, but it impacted terrain and slid into a tree. The pilot reported that there were no preimpact mechanical malfunctions or anomalies with the airplane that would have precluded normal operation. Examination of the wreckage revealed substantial damage to both wings and the fuselage. The recorded weather at an airport located about 15 miles from the accident site, about the time of the accident, included a left quartering headwind at 9 knots. The pilot's loss of directional control during takeoff in gusting crosswind conditions.